This is no ordinary scissor lift, take a look at that picture! 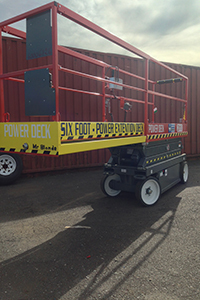 Equipped with a six foot power extension deck, this lift takes you where no other scissor can. It can be used inside and outside of buildings and reach areas you never thought possible. Ideal for tight areas booms can’t get into like elevator shafts and parapets on the seventh floor. The deck can be extended from the platform allowing workers to reach new areas and work efficiently. We have other scissor lift sizes as well!